are increasingly interested in farm animal welfare & care for a variety of reasons. The manner in which an animal is raised not only is indicative of food safety & health but impacts the taste of the food as well. Consumers appear to be willing to pay for food perceived to be of higher quality. With outbreaks of diseases such as foot & mouth disease, “mad cow” disease, salmonella, food poisoning or e. coli, consumers become more interested in the manner that the animals are raised. Select products raised in humane conditions as opposed to those raised in confinement agriculture. Buy only free range, organic or certified humane products. The "Certified Humane Raised & Handled" label creates a win-win-win situation for retailers, restaurants, producers, & consumers. For farmers, the win means they can stand out in the market place, increase market share & profitability by choosing to utilize sustainable farming practices. 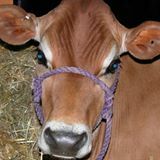 eatwellguide.org Plug in your zip code to find farms, markets & restaurants for humanely raised food. The SustainableTable.org Shopping Guides list local & national directories for sustainable food. American Humane Association A reliable "third-party" farm animal welfare certification program. eatwild.com can help you find retailers who use suppliers of local pasture-raised meats. Avoiding factory farmed food: An eaters' guide. Insert your Zip Code for a list of retailers near you!